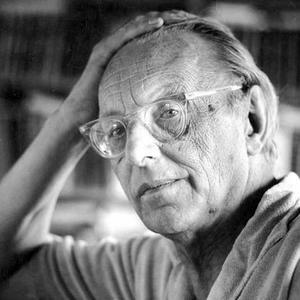 Carl Orff (10th July 1895?29th March 1982) was a German composer, most famous for his Carmina Burana (1937), and an important and influential music educator. Orff was born in Munich and came from a Bavarian family that was very active in the German military. His father's regimental band supposedly often played the compositions of the young Orff. He studied at the Munich Academy of Music until 1914, then served in the military during World War I. Afterwards he held various positions at opera houses in Mannheim and Darmstadt, later to return to Munich to further pursue his musical studies. Orff was a personal friend of Kurt Huber, one of the founders of the resistance movement Die Wei?e Rose (the White Rose), and who was condemned to death by the Volksgerichtshof and executed by the Nazis in 1943. After World War II, Orff claimed that he was a member of the group, and was himself involved in the resistance, but there was no evidence for this other than his own word, and other sources dispute his claim). With the success of Carmina Burana, Orff orphaned all of his previous works except for Catulli Carmina and the En trata, which were rewritten until acceptable by Orff. He was reluctant to call any of his works simply operas. For example, he called Der Mond ("The Moon") (1939) a "M?rchenoper" or Fairytale Opera, and placed Die Kluge ("The Wise Woman") (1943) in the same category. About his Antigone (1949), Orff said specifically that it was not an opera, rather a Vertonung, a "musical setting" of the ancient tragedy. The text is a German translation, by Friedrich H?lderlin, of the Sophocles play of the same name. The orchestration relies heavily on the percussion section, and is otherwise fairly simple.